Directions: Solve as many as you can of the problems on this sheet of paper. On separate sheets, in an organized way, show how you solved the problems. You will be awarded full credit for a complete correct answer which is adequately supported by mathematical reasoning. You can receive half credit for correct answers which are the result of guesses, conjectures or incomplete solutions. Included as incomplete solutions are solutions that list some, but not all, solutions when the problem asks for solutions of equations. The decisions of the graders are final. You may earn bonus points for "commendable solutions" - solutions that display creativity, ingenuity and clarity. Your answers and solutions must be postmarked by February 1,2000 and submitted to Tony Trono, Vermont State Mathematics Coalition, 419 Colchester Avenue, Burlington, VT 05401. 1. Find the number of digits in the number (3219 ).(599). 3. 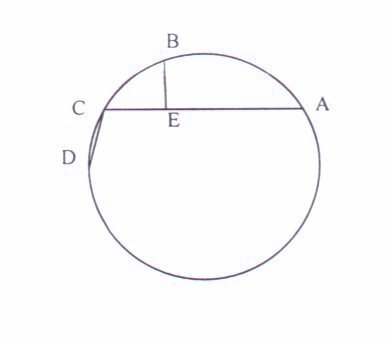 You are given that arc AB = arc BD and that BE is perpendicular to AC. The lengths CD = 4n and CE = 4n + 3. 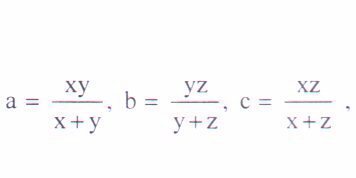 If length AE = an + b, then find the sum a + b.
then find y in terms of a, b and c.
5. Let z be one of the imaginary roots of x3 = 8. Evaluate (4 - 2z + z2). (4 + 2z + z2). 6. Two of the roots of the equation 2x3 - 8x2 + 9x + p = 0 are also roots of the equation 2x3 + 8x2 - 7x + q = 0. Evaluate 19q + 99p. 7. In acute triangle ABC, altitudes AY and BX are drawn to sides BC and AC respectively. Lengths BY = 20 and AY = 99. If possible, find the sine of angle AXY. If not possible, state why it is not possible.